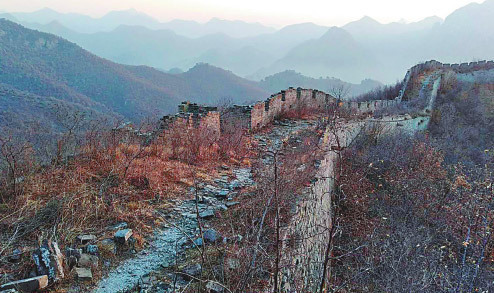 A farmer committed to guarding the Great Wall from damage or theft in Hebei province is intent on preserving the cultural treasure in its original state. Zhang Heshan, 62, from Chengziyu village in Qinhuangdao, has been a ranger for 40 years, patrolling and protecting a 10-kilometer section of the wall constructed during the Ming Dynasty (1368-1644). The section, which spans seven villages including Chengziyu, has several forms of fortifications typical along the famous sprawling structure, such as watchtowers, miniature castles, passes and platforms to observe and fire at enemies below. "This is a historic treasure that all generations should protect," Zhang said. He started to patrol the wall in 1978 when he found considerable damage done by local villagers, who had pilfered its bricks for their own use or smashed engraved stone tablets. "The wall has been a part of me since I was a child," Zhang said, adding that he used to play on the structure with his classmates. "If the fortifications were destroyed and reduced to rubble, how would I be able to relate the history of the wall to my grandchildren, and how could they play on it just as I did when I was young?" he asked. On an almost daily basis Zhang spends about four hours walking along the wall to see if there is any fresh damage. Most days he catches people in the act of stealing bricks or herding sheep on the wall, and stops them in their tracks. However, due to his daily patrols, resentment toward him from villagers and even his family has increased day by day. "Due to my oversight, would-be thieves and vandals can't continue to commit such actions on the Great Wall, and they are not happy about this," Zhang said. His wife, Wang Yuexia, was opposed to his patrols because a great deal of Zhang's time has been spent on the wall rather than doing farm work or earning more money in another occupation. "People just didn't realize and appreciate the importance of my guarding the wall at the time," he said. "I've committed myself to protecting it in much the same the way that I protect the wall that surrounds my courtyard, so that its greatness can be seen and appreciated by future generations." Zhang has insisted on performing his safeguarding duty for decades. He has worn out more than 200 pairs of shoes, and the distance he has covered during the patrols could have taken him around the globe twice. His perseverance has gradually paid off. In 2002 he became the first farmer member of the China Great Wall Society and was officially hired as a Great Wall protector by the local cultural heritage bureau the following year. In 2007, Zhang was awarded with a national honor－Outstanding Cultural Heritage Protector by the State Administration of Cultural Heritage for his enthusiasm and contribution to preserving the Great Wall. Recognition from the authorities eventually won him acknowledgment from other villagers and his family. "Although I still don't earn much money, I'm considered the pride of the whole family, and villagers have voluntarily stopped damaging the wall," Zhang said. Even foreign visitors to the relic have been impressed by what he has done to protect the massive historical artifact. William Lindesay, the British founder and director of the International Friends Society of the Great Wall, met Zhang in 2007 when he was traveling along the Chengziyu portion. Impressed by the section and what Zhang had been doing to preserve the Wall, Lindesay took other members of his group and a sponsor to visit Zhang in 2008. Together, they launched a Great Wall protection project to fund six wall rangers like Zhang for two years, and helped Zhang publish a book－Whispers from the Wall: Great Wall Folktales told across the Centuries－which contains folk tales about the Chengziyu Great Wall. In addition to Lindesay's efforts, more travelers from near and far have visited Chengziyu in recent years. "They like the original state of the wall rather than some newly constructed segments in modern times," Zhang said. He said some sections near Chengziyu have been developed and renovated to become scenic spots. "I hope the Chengziyu section can become a famous tourist attraction, too, but definitely not with too much development or renovation," he said. "I want the Wall and its natural surroundings to maintain their original state." Since last year, Zhang has been invited by various media organizations to share his knowledge and ideas about preserving the ancient structure. "Thanks to them, more people can hear my plea, and as a guardian of the Great Wall, I want to spread the word: Let's all work together to preserve the Great Wall."